(Photo: REUTERS / Max Rossi)A woman prays in front of a painting depicting Pope John Paul II in a church in downtown Rome April 22, 2014. On Sunday, Pope Francis will canonize late Pope John Paul II, who reigned from 1978 to 2005, and Pope John XXIII, who was pontiff from 1958 to 1963 and called the Second Vatican Council, a landmark meeting that modernized the Church. The Simon Wiesenthal Center says it is joining with Roman Catholics around the world in acknowledging the remarkable contribution of the two popes to be canonized Sunday. 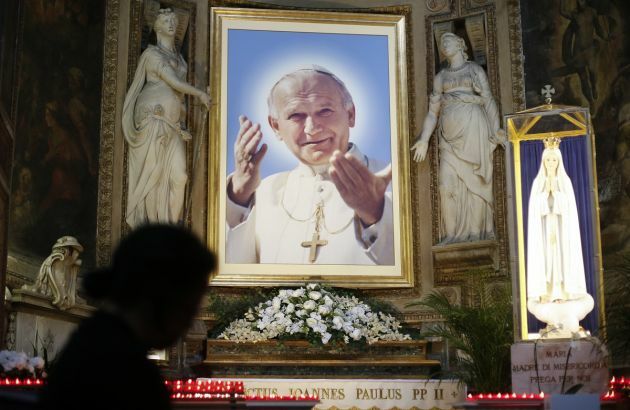 Two modern popes - John Paul II and John XXIII - are to be canonized at the Vatican Pope Francis with huge crowds expected in St. Peter's Square. "Jews will always remember Pope John XXIII as the animating force behind the Vatican II Council that changed the way Catholics looked at other faiths, especially Judaism. "The Nostra Aetate document that ensued from it pulled the plug on centuries of theological anti-Semitism and put relationships between Christians and Jews on a new footing of mutual respect," said Rabbi Yitzchok Adlerstein, the Wiesenthal Center's interfaith affairs director in a statement. The Simon Wiesenthal Center is a global Jewish human rights organization that confronts anti-Semitism, hate and terrorism, promotes human rights and dignity, stands with Israel, defends the safety of Jews worldwide. The saint-making will be first time in the history of the Catholic Church when two popes receive the honor simultaneously. "Pope John Paul II termed the theory of Nostra Aetate into dramatic proactive," noted Rabbi Abraham Cooper the associate dean of the Wiesenthal Center. "He became the first pope to visit a Jewish house of worship, embracing Rome's Chief Rabbi Elio Toaff and calling Jews the "elder brother" of Christians. Two other dramatic deeds - one practical, the other symbolic - forever secured him a special place in the hearts of the Jewish people," said Cooper. Rabbi Marvin Hier, Dean and Founder of the Simon Wiesenthal Center, who met twice with Pope John Paul II at the Vatican, recalled his recent audience with Pope Francis and their conversation about the work of these two great predecessors. "We thanked him for his ongoing commitment to fight anti-Semitism and underscored our commitment to work with the Pope to protect the rights of religious minorities, especially embattled Christians."